Senate Majority Leader Mitch McConnell said Saturday he will delay consideration of health care legislation in the Senate, after Sen. John McCain’s announced absence following surgery left Republicans short of votes on their marquee legislation. 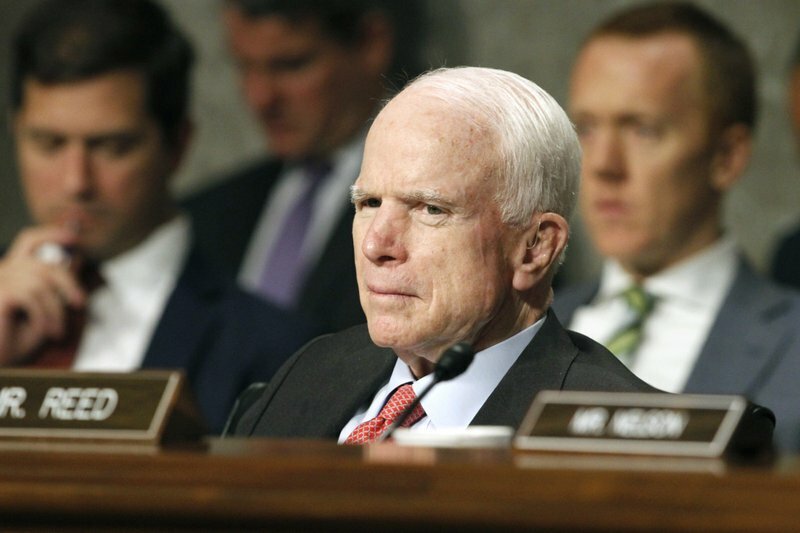 In this July 11, 2017 file photo, Senate Armed Services Committee Chairman Sen. John McCain listens on Capitol Hill in Washington, during the committee’s confirmation hearing for Nay Secretary nominee Richard Spencer. Circle August 16th on your calendars – That’s the date Jack Latvala will publicly announce his plans for 2018. He’s expected to run for Governor, but there’s a possibility he could pull an audible (CFO? No run at all?). Latvala shared this nugget with those in attendance at his “old fashioned pig roast” event/fundraiser in Boothbay Harbor. Spotted at Latvala’a fundraiser in Maine: Senate President Joe Negron and Sens. Lizbeth Benacquisto, Anitere Flores, Bill Galvano, George Gainer, Rene Garcia, Denise Grimsley, Debbie Mayfield, Kathleen Passidomo, and David Simmons, former Sens. Ellyn Bogdanoff and Dennis Jones, Reps. Heather Fitzenhagen and Chris Latvala. Also David Browning, Crystal Stickle, Lisa Hurley, David and Laura Jolly, Nicole Haggerty and Richard Reeves, Kim McDougal, Sandy Mortham, Dale Patchett, Teye Reeves, Andrea Reilly, Sandy Safley, Clark Smith, Greg Smith, Jim Smith, Alan Suskey. In a column for the Pensacola News-Journal this week, cartoonist Andy Marlette calls out members of the House Panhandle delegation for their unanimous backing of Rep. Matt Caldwell for Agriculture Commissioner and lays out why he thinks Floridians should give Sen. Denise Grimsley a chance. But Marlette said he didn’t understand how local officials were taking their civic duties seriously when there was potentially a “smarter, more experienced and more qualified Republican candidate” vying for the job. That candidate, Marlette said, is Grimsley. He met with Grimsley during a stop at the Pensacola News-Journal last week, and described her as the “least politician-y politician” he ever met. “Richard Corcoran hires consultants who did Trump’s TV ads” via Steve Bousquet of the Times/Herald Tallahassee Bureau — House Speaker Richard Corcoran’s Watchdog PAC has hired Jamestown Associates, the Philadelphia-based Republican media firm that shaped Donald Trump’s TV ad campaign against Hillary Clinton in 2016. The firm’s CEO, Larry Weitzner, and Barney Keller will provide strategic advice to Corcoran as he considers a possible run for governor of Florida next year. They will join with the Fort Lauderdale-based pollster Tony Fabrizio, who has advised Gov. Rick Scott in addition to a long list of GOP candidates around the country. Adding Jamestown Associates is likely to accomplish the obvious goal of generating more buzz about Corcoran’s political plans. Assignment editors: Graham will make a major announcement at 1 p.m. at the Mary L. Singleton Senior Center, 150 E. 1st Street in Jacksonville. Assignment editors: Andrew Gillum will address the Orange County Democratic Party meeting at 7 p.m. at Frontline Outreach, 3000 C.R. Smith Street in Orlando. 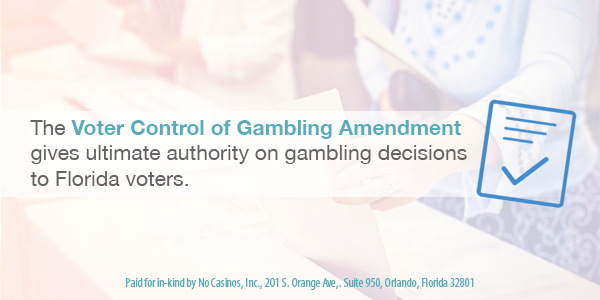 “Gambling control amendment surpasses 100,000 signatures” via Florida Politics – A proposed constitutional amendment aimed at limiting gambling’s expansion in the state is now over the 100,000 signature mark. Division of Elections records show the “Voter Control of Gambling” amendment now has 104,416 signatures toward getting on the 2018 statewide ballot. But that’s still a long way from the 766,200 signatures needed for the initiative’s ballot placement. “Our petition gathering effort is in full swing across the state of Florida,” said John Sowinski, who chairs Voters in Charge, the political committee behind the amendment. He added there is another roughly 300,000 signatures “in the pipeline” waiting to be verified. J.D. says N.O. – Former Republican lawmaker J.D. Alexander will not run for senate in 2018 according to future Senate President Bill Galvano. The Bradenton Republican told POLITICO’s Matt Dixon that it was his understanding Alexander wouldn’t enter the SD 26 race to replace Sen. Denise Grimsley, who is leaving the seat to run for Ag Commissioner. That leaves Republican Rep. Ben Albritton with a clear path to take over for Grimsley in the GOP-leaning seat, which alongside SD 16 is one of just two senate seats up for grabs in 2018 without an incumbent in the race. Registration deadline for HD 44 race — Monday is the deadline to register to vote in the Aug. 15 special primary to replace Rep. Eric Eisnaugle in House District 44. Republicans John Newstreet, Bruno Portigliatti, Robert Olszewski, and Usha Jain will be on the ballot. Florida is a closed primary state, which means only registered Republicans can vote in the Aug. 15 primary. The winner of the race will face Democrat Paul Chandler in the Oct. 10 special election. “Vito Sheeley to challenge Wengay Newton in HD 70” via SaintPetersBlog – Vito Sheeley opened up his campaign account for the seat on Friday and is the only candidate running against Newton, who took over for now Sen. Darryl Rouson after winning a three-way Democratic against Dan Fiorini and Chris Czaia. HD 70 is a minority access district that covers parts of Hillsborough, Manatee, Pinellas and Sarasota counties. About 45 percent of the population is black, and 15 percent is Hispanic. Through the end of June, Newton had raised just $4,800 for his re-election campaign and had about $4,300 of that money on hand. Sheeley’s first report, which will cover the second half of July, will no be available until mid August. — Click here to read Mitch Perry’s profile of HD 71 candidate Randy Cooper. “Florida State University to return more money from secret $1 million appropriation” via Arek Sarkissian of the Naples Daily News – Florida State University will return more than expected from a $1 million grant lawmakers secretly tucked inside the university’s budget for the friend of a state senator, according to a letter from FSU President John Thrasher. Thrasher, in a letter to House Speaker Richard Corcoran, promised to return $310,000 from the $1 million Fernandina Beach-based Florida Psychological Associates received in last year’s $82.3 billion state budget. The firm received the money with the help of Sen. Aaron Bean, who is a longtime friend of the owner and her husband, Nassau County Tax Collector John Drew. In response, Thrasher sent another letter to Corcoran stating he would return the $210,000 remaining after FSU canceled its contract with the firm. The $100,000 in unspent administrative money would also be returned to the state’s treasury by the end of the month, Thrasher said. “Jeff Brandes, Darryl Rouson agree that Florida’s broken criminal justice system needs to change” via Melissa Gomez of the Tampa Bay Times – “(Brandes) and I are diametrically opposed on many political philosophies,” said Rouson to a crowd of about 40 at the St. Petersburg Yacht Club. But sitting side by side, they spoke about their combined efforts to push through reform of Florida’s “broken” criminal justice system. … Despite his and Brandes’ efforts at reform in the most recent legislative session, Rouson said, their proposals failed. But they plan on trying again. Brandes believes it’s going to take a comprehensive review of the system to bring change. Everything from mental health services, to jails, to prisons and sentencing need to be improved. Sens. 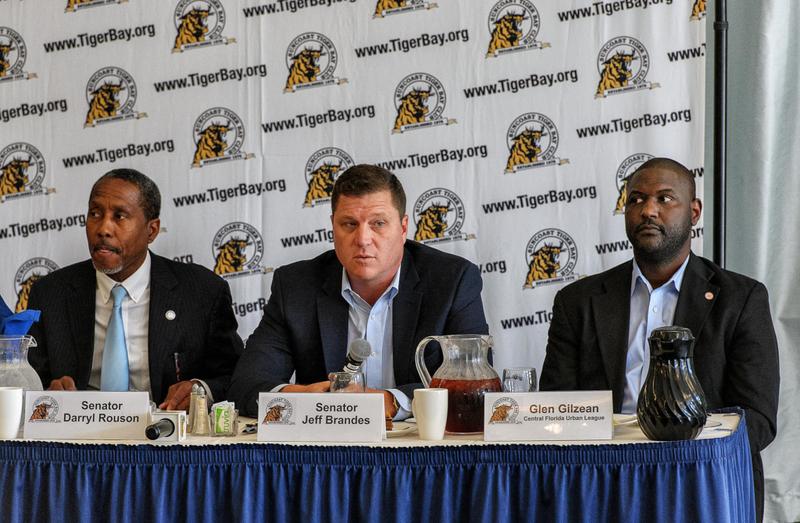 Darryl Rouson and Jeff Brandes and Central Florida Urban League CEO Glen Gilzean during a discussion at the Suncoast Tiger Bay Club luncheon on the future of Florida’s criminal justice system. Photo credit: Benjamin Todd. “Bill Nelson seeks support to cap student loan rates at 4 percent” via Bryon Dobson of the Tallahassee Democrat – Nelson’s legislation comes on the heels of federal student loan interest rates increasing July 1. Rates for undergraduate students increased from 3.76 percent to 4.45 percent. Nelson’s bill would cap those rates at 4 percent. It also allows borrowers with existing student loans that have a rate higher than 4 percent to refinance their loans once to the new lower rate. “Carlos Cubelo’s gang of moderates Republicans defeats anti-climate change legislation” via Alex Daugherty of the Miami Herald – Curbelo’s Climate Solutions Caucus, a group of 24 Republicans and 24 Democrats who are concerned about the impacts of climate change, voted en masse on Thursday against a proposal to nix a Defense Department report on the threats posed by climate change to military installations. … Curbelo identified Thursday’s vote, part of the massive annual Defense Department funding bill which passed on Friday, as an area where moderate Republicans can make an impact. … “I assume that now when we get into appropriations season there will be many amendments where I assume our group is going to be critical to blocking bad policy,” Curbelo said last month. 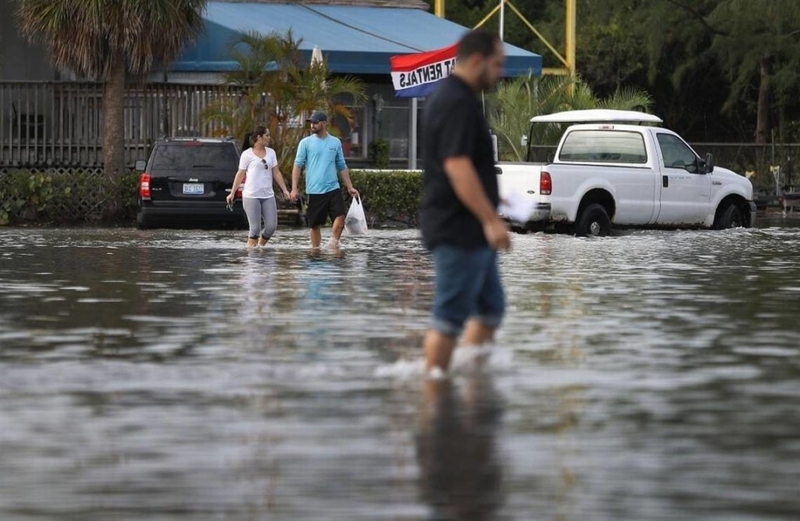 Yaneisy Duenas and Ferando Sanudo walk through the flooded parking lot to their boat at the Haulover Marine Center on November 14, 2016 in North Miami, Florida. The flood waters are caused by the combination of the lunar orbit which causes seasonal high tides, also known as a King tide, and what some scientists believe is rising sea levels due to climate change. Photo credit: Getty Images. “Francis Rooney backs off criticism of college ‘safe zones’ ” via Alexandra Glorioso of the Naples Daily News – Rooney said he believed safe zones were to blame for conservatives being unable to speak at universities and didn’t realize they could refer to specific university programs established to help historically marginalized students feel more secure. “I would never file anything that would harm or threaten these students,” said Rooney, of Naples. “I slightly misspoke. I don’t have a problem with anything that keeps people from bullying. Save the date: Rooney will hold a “supporter appreciation cookout” at 11:30 a.m. on July 29 at the Bonita Springs – Estero Elks Lodge, 3231 Coconut Road in Bonita Springs. “D.C. needs to start rewarding efficiency, not inefficiency” via Rick Scott for Florida Politics – While a new bill has been introduced this week, it has taken far too long to get rid of the disaster of Obamacare, and I fear the politicians in Washington will never find common ground on this critical topic. There is absolutely no question that Obamacare must be repealed immediately so Americans can actually afford to purchase health insurance. … States like Florida that have run increasingly efficient Medicaid programs, and have not expanded Medicaid, must be rewarded and treated fairly under any bill. What’s concerning is that under the most recently proposed Senate bill, tax and spend states like New York will continue to be rewarded for running an inefficient Medicaid program. As a reward for its fiscal irresponsibility, for every dollar New York pays in federal income taxes, they receive a quarter back from the federal government for Medicaid. In comparison, Florida only receives 16 cents for every tax dollar that is sent to Washington. Current Congressional bills lock in past federal spending, which would make this inequity permanent. That makes absolutely no sense. If Florida is going to get a smaller rate of return on its federal taxes, shouldn’t our federal taxes be cut? New York, with fewer residents than Florida, receives more than $33 billion per year for Medicaid while Florida receives less than $15 billion. How is permanently locking in these spending levels fair to Floridians when New York has been terribly inefficient with their taxpayers’ dollars? The federal government should cut income taxes for Floridians by 30 percent. This would put our share of federal Medicaid funding as a percentage of taxes paid on par with New York. This reduction would save Floridians thousands each year. The federal government must start rewarding efficient states like Florida and stop rewarding inefficient states. Our taxpayers deserve nothing less. Secretary of the Department of Housing and Urban Development Dr. Ben Carson will make a stop in Orlando Monday to deliver the keynote address at LeadingAge Florida’s annual convention. LeadingAge is a non-profit whose members provide senior health care and housing services at nursing homes, assisted living facilities, and continuing care retirement communities. Members of the health care organization have been big proponents of Carson since he was confirmed as HUD secretary March 2 by Congress. Carson’s speech is not open to the public. “Constitutional review panel announces committee assignments” via Florida Politics – The state’s Constitution Revision Commission announced committee assignments, consisting of “10 standing substantive committees and two standing procedural committees,” it said in a Friday news release. “Establishing committees for the CRC means we can move forward on developing proposals that will benefit Florida families, businesses and students,” Chairman Carlos Beruff said in a statement … The commission, which already has held several public hearings, is empaneled every 20 years to go over the state constitution and suggest amendments that go directly on a statewide ballot. Voters still must OK any changes with 60 percent approval. “Critical audit of Suwannee River water district exposes downside of deep cuts” via Mary Ellen Klas of the Miami Herald – The Suwannee River Water Management District, which oversees land and water resources in a 15-county rural swath of north-central Florida, failed to properly account for more than $26 million, according to a critical audit recently released by the Florida Auditor General. Weak budgetary controls led to $22.5 million in “questionable costs,” auditors found. Officials had transferred $13.3 million of it into the district’s operating account without proper authority. They may have overspent some areas of the budget and directed money to other areas to make up for shortfalls. They set aside $3.8 million “in the event of an economic crisis” without authorization, and they steered $1.7 million “to cover routinely anticipated budget shortfalls” without explanation. Auditors concluded that accounts were “misclassified because district personnel misunderstood” standard accounting requirements and budget staff members were “somewhat new to the process” so they couldn’t explain how and why it happened. Appointed – Michael Vallencourt (reappointed) to the Clay County Utility Authority; Creston Leifried to the Florida Housing Finance Corporation; Ben Gibson to the Florida Board of Education and Katherine “Katie” Cole to the District Board of Trustees, St. Petersburg College. “Rooted in Florida: German, Irish ancestries tops in state” via the Associated Press – New U.S. Census data released last week shows that about 10 percent of Florida’s 20 million residents say they have German ancestry. About 9 percent of Floridians claim Irish roots, more than 7 percent claim English ancestry and 7 percent claim Cuban roots. The ancestral roots with the smallest representation in Florida were Somalis, Ugandans and people from Sierra Leone. “it’s July, and retailers want you to think ‘back to school’” via Charisse Jones of USA TODAY – Amid the joys of summer, is it really time to think about heading back to school? Yes. At least that’s the message being sent by some of the nation’s biggest retailers, which already have back-to-school promotions in full swing. Chains started hyping everything from folders to pencils as early as late June. Some of the discounts seem modest, like the 10 percent off backpacks at Target, while others run pretty deep, like 60 percent off select school uniforms at J.C. Penney. The midsummer push is partly aimed at early start dates of some school districts that resume classes long before Labor Day. But there’s also a bottom-line urgency. Parents plan to spend an average of $501 per student to get their kids ready for a return to the classroom, according to a survey by consultancy Deloitte. That adds up to a projected total of $27 billion. That’s a pittance compared to U.S. retail sales that were running at nearly $5.4 trillion as of 2015, but every buck counts right now for retailers. “Disney World getting immersive Star Wars hate, ‘Guardians’ and ‘Trone’ rides” via The Associated Press – Bob Chapek, Walt Disney Parks and Resorts Chairman, led a joyous panel where he unveiled many new projects for both domestic and international parks. New “Ratatouille,” “Guardians of the Galaxy” and “Tron” attractions are headed to Walt Disney World in Orlando. Discussion of the Star Wars land came early in Chapek’s presentation, pleasing an eager audience. A video detailed a model on display at the expo’s “A Galaxy of Stories.” Then, Chapek revealed the name for the expansions. Star Wars: Galaxy’s Edge will first open at Disneyland, followed shortly by a second, identical location at Hollywood Studios at Walt Disney World. Chapek said both are expected to open in 2019. “Disney Springs celebrates Christmas in July” via Terry Roen of Orlando Rising – The Springs’ fountains will be decked for the holiday season and Disney Springs Marketplace while offer holiday-themed treats, merchandise and entertainment. Even Santa will be dressed for the heat at a special meet and greet at Disney’s Days of Christmas. “Summer Santa” will be available for photographs 1-10 p.m. The Art of Disney is featuring holiday inspired art with artist meet and greets. Dockside Margaritas is pouring the Snowflake Margarita, and Starbucks in the Marketplace is offering their holiday-themed drinks. The seasonal celebration begins Saturday and runs through July 30.